Flatite is a Modern and Creative premium Joomla Template. 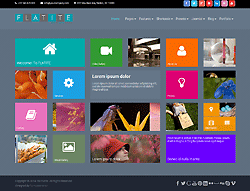 Flatite theme is made in a beautiful Windows8 style look. It is suitable for Personal Portfolio, Creative Agency, Designer Portfolio, Illustrator Portfolio, Photographer Portfolio and more. Theme has a universal design, it thought every detail and animation effect. The joomla theme was built with Drag and drop page builder so you can easily customize to fit your needs, just replace images and texts. Flatite is a perfect theme for a variety of uses from blogs to personal or business portfolios. It is clean coded, 100% validated template with extensive documentation.